*Following the success of “Lee Daniels’ The Butler,” ABC has put in development a limited series about another famous black White House servant, reports Deadline.com. “A Slave In The White House,” from filmmakers Sheldon Candis and Justin Wilson (“LUV“) and Deborah Spera and Maria Grasso’s One-Two Punch Prods, is a 12-hour limited series based on the true story of Paul Jennings, a Virginia-born slave who served as personal valet to President James Madison while also working behind the scenes as a subversive anti-slavery activist. Based on Elizabeth Dowling Taylor’s bestselling book, “A Slave In The White House” chronicles Jennings’ relationship with the Madison family, becoming the President’s surrogate son, and his journey to procure his own family’s freedom. Jennings spent his entire life in and around the White House from age 10 and, after buying his freedom at age 46, wrote the first White House memoir, A Colored Man’s Reminisces Of James Madison. The TV project has a special meaning for Wilson as its deal came together on the day his father suddenly passed away while the two were hiking together on the Inca Trail in Peru. In Candis and Wilson’s first foray into TV, the two will write and co-executive produce “Slave In The White House,” with Candis directing and Spera and Grasso executive producing. Candis and Wilson’s debut feature film “LUV” premiered at the 2012 Sundance Film Festival and was released in theaters in January, with the screenplay earning the duo a 2012 Humanitas Prize nomination. A Slave in the White House: Paul Jennings and the Madisons is now a New York Times Bestseller. For the week ending 22 January 2012, the book was #35 in the category of of E-book nonfiction best sellers. For the week ending 29 January 2012, the book was #31 in the category of hardcover nonfiction best sellers. Check out the listing of New York Times Bestsellers. “The Daily Show” on Comedy Central, Wednesday, 4 January 2012, 11 p.m. ET; the author discusses her newly-released book with Jon Stewart. 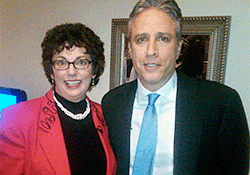 In the photo on the right, Dr. Taylor enjoys a casual moment in the green room with Jon Stewart. Watch the entire interview online. 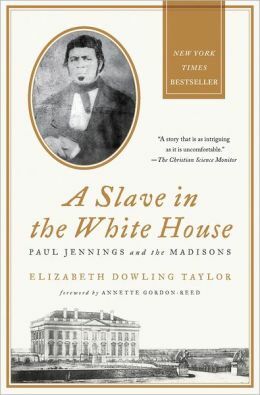 A Slave in the White House: Paul Jennings and the Madisons was reviewed by Jonathan Yardley in the Sunday Washington Post on 15 January 2012. A Slave in the White House: Paul Jennings and the Madisons has been nominated for the 2012 National Book Award in nonfiction!! On 17 May 2012 the Library of Congress announced the authors selected as speakers at the National Book Festival which will take place on 22-23 September 2012 on the National Mall. Elizabeth Dowling Taylor was included among such notable authors as Philip Roth, Thomas Friedman, Mario Vargas Llosa, T.C. Boyle, Walter Isaacson, Marilynne Robinson, Geraldine Brooks, Philip Levine, Jeffrey Eugenides, Robert Caro. For an interview with author Elizabeth Dowling Taylor on the Dr. Alvin Jones radio show, go to www.dralvinjones.com and scroll down along left hand column to the book cover for A Slave in the White House and click on it. The PBS American Experience documentary on Dolley Madison first aired on 1 March 2010. This is a Middlemarch Film—their signature technique is to have the characters speak close up, directly to the camera, reciting only words from actual letters and diaries. Paul Jennings is one of the historical characters “cast.” Beth Taylor is one of the scholars featured in on-camera interviews. Watch the documentary on the PBS website. 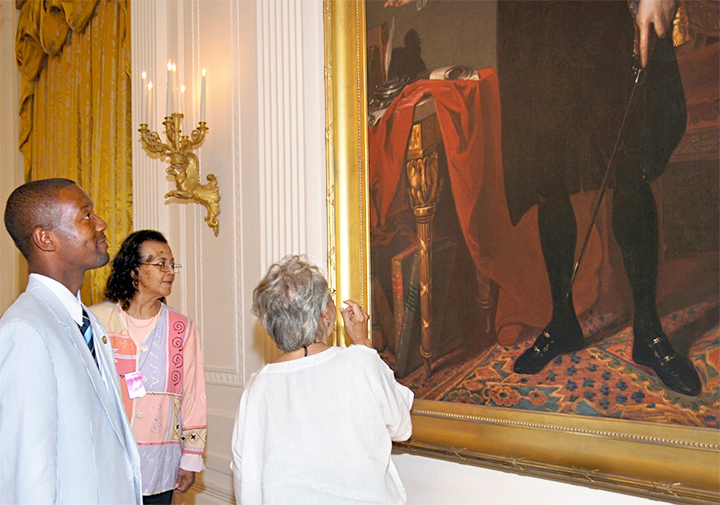 On 24 August 2009, the anniversary of the day that their ancestor helped Dolley Madison rescue the iconic portrait of George Washington from the burning White House, the Paul Jennings descendants were treated to a private tour of the White House. Below is a photograph of a few of the descendants examining the enormous portrait, which thanks to the actions of Jennings and others that day, now graces the East Room of the White House. Press coverage for the event included the New York Times, NPR’s “All Things Considered,” and the CBS Evening News. Follow the links below to view the stories and articles. 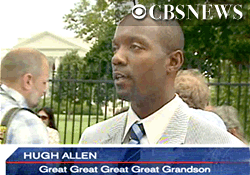 The CBS Evening News aired a story that featured short commentary from a few of the descendants on the day of their White House tour. From the CBS News homepage, type: “A Slave’s Story” in the search box to locate the news clip. The former director of education at James Madison’s Montpelier debuts with the biography of Paul Jennings, a slave who grew up with the Madisons, was with the former president when he died, gained his freedom and sired many descendants. Because Jennings for much of his life was considered merely property, Taylor had to be satisfied with a skeleton of fact, which she fleshes out with imaginative and thorough research, careful supposition and heavy contextual description. . . . An important story of human struggle, determination and triumph. The complex relationship between a president and his bondman abounds in ironies in this revealing study. Historian Taylor reconstructs the life of Jennings, a slave belonging to President James Madison who became his valet, barber and major-domo, bought his freedom from Madison’s widow Dolly, and published admiring reminiscences of the couple. Taylor fleshes out slender sources into a convincing recreation of Jennings’s relatively privileged but precarious existence, setting it against a vivid portrait of the deeply conflicted Madison . . . Taylor paints a fascinating portrait of slavery, hypocrisy, and one man’s quiet struggle to overcome its injustices. Paul Jennings’s remarkable life sheds new light on the central themes of American history during his lifetime and beyond. Taylor’s sensitive reconstruction of one man and his family’s experiences yields fresh perspectives on a wide range of subjects, including but hardly limited to James and Dolley Madison, the Montpelier plantation that was their and Jennings’s home, the African-American experience under slavery, the world of free blacks in Washington City during the late antebellum era, and the Civil War and its legacy. Scholars and general readers alike will not be able to put this remarkable book down. Elizabeth Dowling Taylor has presented us with the gift of a new American hero. With precision and compassion, Taylor deftly brings Paul Jennings out of the shadows of history. Writer, property-owner, freedom fighter, husband, and father—Jennings’s life reveals the complicated humanity behind the designation “slave.” This story will humble and inspire all who believe in the American Dream. Taylor’s careful reconstruction of the life of James Madison’s slave valet reveals American history from a different angle. 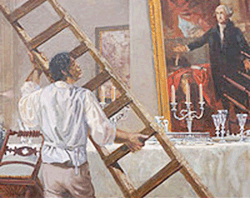 Rescuing George Washington’s portrait from the British army, helping fellow slaves escape, earning his freedom from Dolley Madison with help from Daniel Webster, Paul Jennings led a life full of vivid episodes and famous personalities. 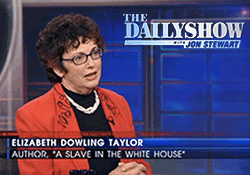 Thanks to Elizabeth Dowling Taylor’s enterprise and craftsmanship in rescuing and reanimating this significant and remarkable, but nearly forgotten, American personality, A Slave in the White House is a gift to the early history of the republic and the long story of black and white interdependence. There are many tales in this fabulous book including the saving of the portrait of George Washington by Gilbert Stuart that hung in the White House and was in danger during the War of 1812 as the British Army torched the building . . .Even if you are not a lover of biographies and/or memoirs, please pick this one up. The author did an amazing job in researching this book with the help of Jennings descendants. It’s a keeper. Long-time readers of my reviews know that I admire a well-researched book. “A Slave in the White House” is just such a book. Elizabeth Dowling Taylor’s book about Paul Jennings, a man born into slavery on the James and Dolley Madison estate, brings the time period and historical personae to life through a fascinating perspective . . . Taylor not only reviewed letters and historical documents to learn Jennings’ story, but also spoke to his descendants who had not only carried on the oral history about their ancestor but also had some of his belongings and letters themsleves. Taylor presents a multi-faceted man who took advantage of his environment (being in the room when discussions about freedom, etc., took place among his “master” and guests) to achieve success during a time when the deck was very much stacked against him. Highly recommended.